Category: 08. Music, 09. Video. Tags: music, music of the spheres, planet scapes. 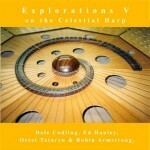 The idea for the Celestial Harp came from a vision after thirteen months of meditating in solitude in India. 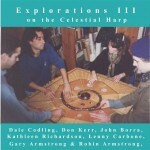 The vision was a merging of Astrology, the I Ching, colour and music, The Celestial harp was designed to play a person’s horoscope and even the horoscope of the moment one was playing. 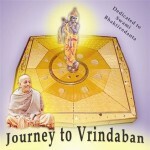 It is a 72 stringed instrument with strings radiating out from a central core. There are eight double strings and frets fro every string. The music moves around a circle and there is no real beginning or end to it. It is designed for several people to play at the same time. It is a classical instrument and it is both acoustic and percussive. It incorporates the rhythms of the Zodiac and the changes within the I Ching. The constellations are inlaid in the top of the harp and each string represents one hexagram. As the strings radiate out, they cross over a spiral bridge, a circle of frets and a square bridge. 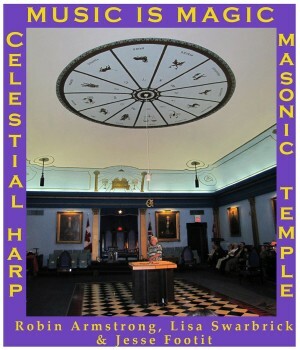 The relations of the spiral, the circle and the square represent the mathematical foundations of the Celestial Harp. Your fingers represent the Sun, the Moon and the planets. 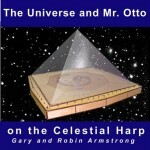 The Celestial Harp represents the birth of a new galaxy in the universe of music. cycle of sounds in the harp and in the zodiac are heard. Harp which is includes the shape of the pyramid in its design. 4. Eightfold Path (6’11”) …Robin Armstrong, Lisa Swarbrick & Jesse Footit. Chanting a sacred chant into the Celestial harp. qualities to reveal to the magician who invokes her. and reveals some of the meaning built into it.